Our Air Juggler is an amusement thats ideal for indoor events that can be played by individual players head to head or by teams of individuals working together. Along each side of the inflatable is a row of flexible cones all producing a continuous flow of air. A ball is placed in the airflow from the first cone on each side so that it hovers in the air and its then a race to move the ball down the table with the player/s carefully moving the ball from cone to cone until it reaches the finish at the far end. If the balls comes out of the airflow it will fall and you have to start again! The Airflow Racer is suitable for use by people of all ages from age 6 to adult and can be played indoors or outside. 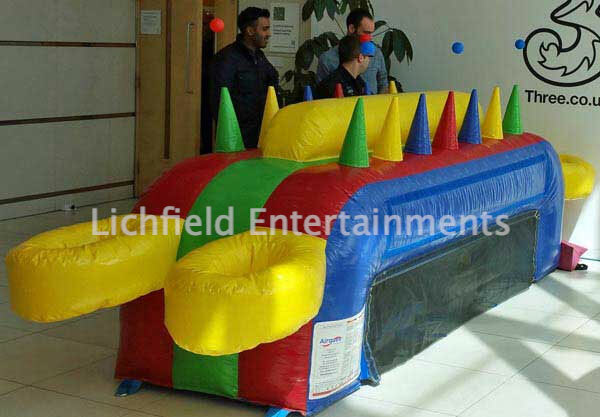 This activity is ideal for team building and corporate fun. You'll need a level area of just 10ft long x 7ft wide overall - this includes room for participants to stand either side of inflatable. The Air Juggler will require a 240v mains electric supply within 50metres. However, if this isn't available we can supply a generator or petrol engined blower for a small additional cost. If you have any queries, questions, or would like to hire the Air Juggler please click here to enquire and we will do all we can to help.